If you know someone with a Siberian you know a walk in their backyard is like being on the moon, all those craters, holes and dirt with no other signs of life...lol. 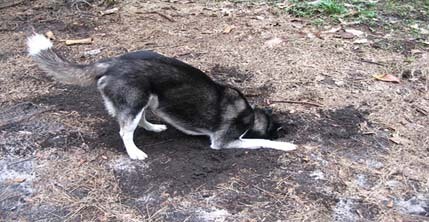 The Siberians natural instinct to dig will amaze and astound you. They can dig a crater size hole, large enough to fit themselves comfortably inside, in a matter of seconds! Why hire someone to dig up an old septic tank or those pesky roots? Just borrow your friend's Siberian instead. The reason digging comes naturally to them is because in Siberia in the freezing winds and cold snow Siberians would dig holes for warmth and to protect themselves from these elements. They would dig their holes and do the Siberian swirl (curl up in a ball with their tail covering their nose) and settle in while the wind blew right over them! This natural instinct can be curbed but not eliminated completely. Siberian Husky owners always keep a couple of old towels by the door for just such occasions, especially here in Florida! From May until September you will notice how worn out the Floridian Siberian owner can get.. can you guess why? 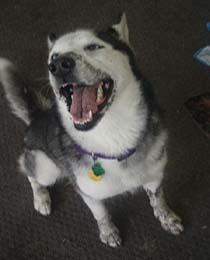 Well between those months is our rainy season and rain + dirt = ONE MUDDY SIBERIAN! The daily routine of grabbing Sibes and wiping them down or corralling them to crates so you don't have mud puppies romping all over your nice clean house can wear anyone out. When most people say "Quick, close those windows it is going to rain", Floridian Siberian owners are running to close doors and doggie doors first to keep their houses from becoming a muddy mess. After all, who cares about a little water getting in the open windows? But mud, now that requires a carpet cleaner! 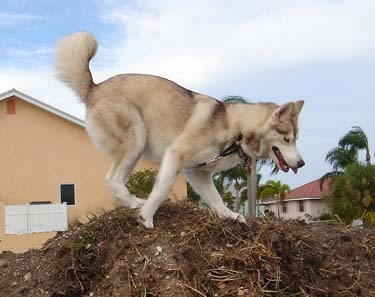 Besides their natural instinct to dig, your Siberian may want to "help" with some light gardening. Sometimes they feel those bushes are in their way and may decide to "uproot" that bush and put it in the middle of the yard where is does not block their view. Also remember, Siberians DO LOVE those veggies so your beautiful prized tomatoes may be an afternoon snack if you don't have them gated up tighter than Fort Knox. As a Siberian owner, your front yard may be like Cypress Gardens but your back yard will eventually look like a deserted planet. With some training you can minimize this or you can learn three little words "It's their yard", repeat these words in succession while taking deep breaths and you will be fine! "OK you caught me, but I have an excuse .. you see there was this white rabbit with a gold pocket watch ....."
"Now I know that gopher is in here somewhere....."